Lazaridis School of Business and Economics alumna Emily Rudow and her co-founder Kayla Nezon were awarded an Ignite Capital Award for their innovative business Oneiric. Rudow’s strong passion for hockey ignited her dream of building products that would make the game safer and more enjoyable for young players. 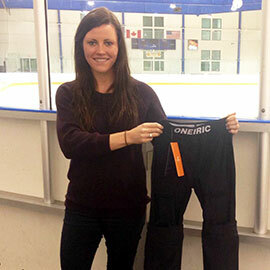 Oneiric’s flagship product – an all-in-one base layer pant designed to give young hockey players extra protection while making dressing easier – started as a new venture project in one of her classes at the Lazaridis School. It was a hit with her classmates, and after four years of research and testing her final product is now available for purchase. Ignite Capital gives Canadian entrepreneurs who have limited access to startup capital the opportunity to turn their ideas into reality. After taking part in Ignite Capital's challenging yet fun application process, Rudow and Nezon had the opportunity to pitch their patent-pending pants to a panel of 15 judges. Oneiric surpassed eight other finalists and was chosen as the 2015 recipient of the Ignite Capital Award in the Youth Entrepreneur category. Oneiric was also recently awarded JumpStart funding through Laurier's Schlegel Centre for Entrepreneurship’s partnership with FedDev Ontario/Ontario Centres of Excellence. To add to her success, Rudow has been accepted into the Laurier Launchpad, an incubator for startups. Working closely with her former professor Steve Farlow, Rudow is ready to take on the next steps in her business venture. "We have some exciting things planned for 2016," said Rudow. "Our hard launch, having product available in some independent retail stores in the Waterloo and Toronto region, working on new pieces of equipment, and moving into adult sizes." Students hoping to following in Rudow's footsteps can take advantage of Laurier's Entrepreneurship Core option, which enables undergraduate students from all faculties to start commercializing business ideas through courses in their second, third and fourth years. For more information, contact Stephen Preece, academic director of the Schlegel Centre for Entrepreneurship, or visit laurierentrepreneur.ca/academic.